It seems every spring I will find a new pair of WHITE JEANS. And white jeans just call for a punchy floral top! White jeans and florals make the most sense to me! There isn’t anything better you could wear to take you in to your warmer season! And both of these pieces will definitely be on repeat clear until next fall! These white jeans are SO DANG CUTE and SO COMFORTABLE too! They fit easy and relaxed through the hips and legs, and then the big wide cuff at the bottom with the red stitching is adorable! They come with this darling striped tie belt, which I actually wore with my red pants in my post from yesterday! The pants are probably more cropped on most….remember my miniature height?!! Can you guess why I was drawn to this colorful floral top? Perhaps the color, the pattern, or the girly details on the sleeves? OR….all of this? It is just so cute! Wear it with a skirt, with jeans, with maybe a yellow linen pair of pants? When you buy an outfit……don’t ONLY WEAR IT TOGETHER forever! Break it up and style each one at least THREE ways! Don’t get stuck! 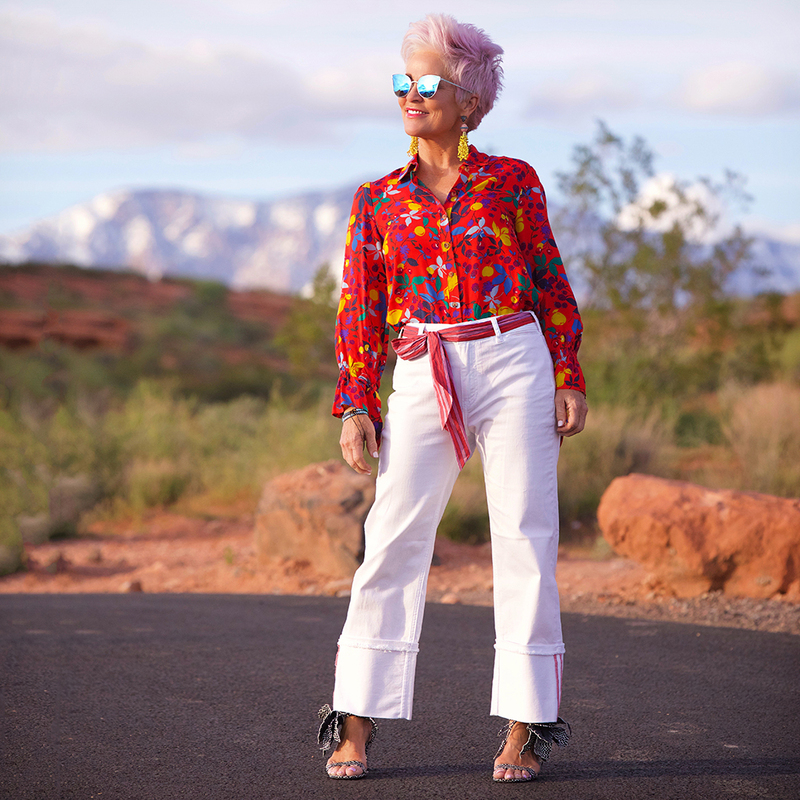 This is how I would wear these white jeans and florals each styled separately and multiple ways. A JUXTAPOSITION SORT OF WAY! And now for this fabulous top! Here are my three ways to style it differently! If you happen to live in Utah, tune in today (Wednesday) to channel 4 to Good Things Utah. I’ll be on between 9-10 am. I would love to have you join me as I talk about ATHLEISURE STYLE! I love BIG, dangly earrings with my short(ish) hair. Yours inspire me! But my sixty year old pierced holes are sliding down lower and lower on my ears. Besides buying lightweight ones, do you have any advice? Hope to see even more of those shoes in the future…they are BEYOND!!!! Hi Juliane, if you hover over the product picture here in this post and CLICK, it will take you to the jeans. The three ways I styled them…..can you see that? Just click on the jeans and it will take you to the site to buy them! Pretty sure I couldn’t pull those funky pants off but boy, you sure do!! So fun. Playful and youthful. Love your confidence. I think I say that all the time.